Italian monthly magazine devoted to Jewish history and literature; founded at Triest in 1863 by Abrama Vito Morpurgo, who edited it six years, and at his death the editorship devolved upon A. di S. Curiel, Morpurgo's son-in-law, its present editor. At times Morpurgo was assisted by Leone Racah and, later, by his son Gustavo. For several years Dante A. Lattes was one of the directors, and he has become the magazine's chief representative and contributor. 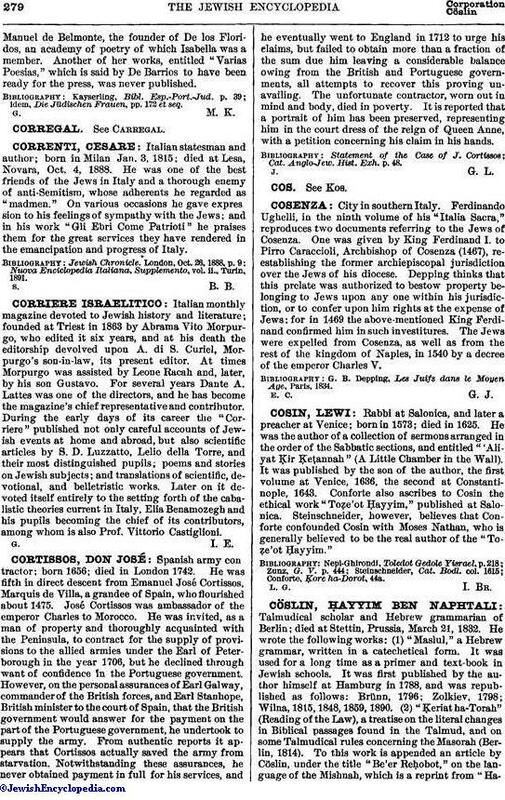 During the early days of its career the "Corriere" published not only careful accounts of Jewish events at home and abroad, but also scientific articles by S. D. Luzzatto, Lelio della Torre, and their most distinguished pupils; poems and stories on Jewish subjects; and translations of scientific, devotional, and belletristic works. Later on it devoted itself entirely to the setting forth of the cabalistic theories current in Italy, Elia Benamozegh and his pupils becoming the chief of its contributors, among whom is also Prof. Vittorio Castiglioni.